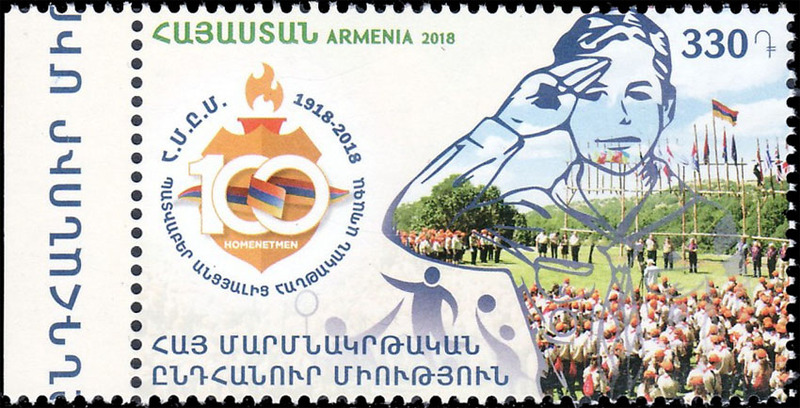 A single stamp issued for the 100th anniversary of Homenetmen, a Pan-Armenian diaspora organization devoted to sport and Scouting founded on 18 November 1918 in Constantinople. 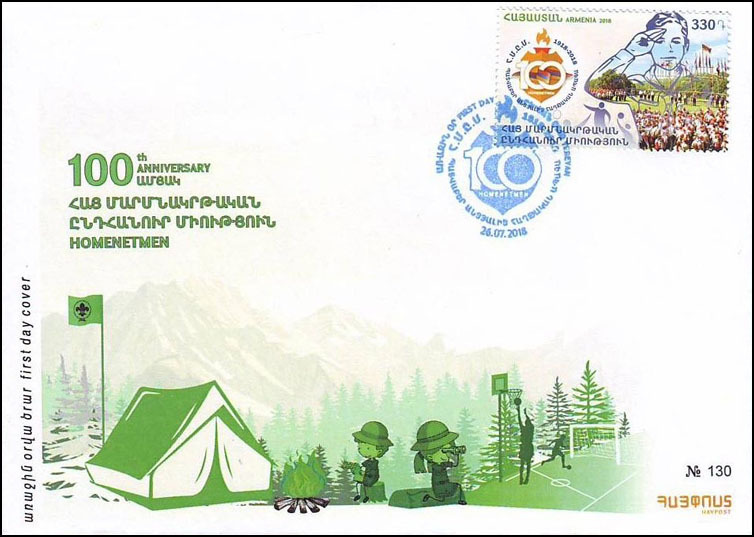 The stamp depicts a fragment of an event staged by Homenetmen, which is in image having the shape of a Scout as well as a logotype of 100th anniversary of Hmenetmen. 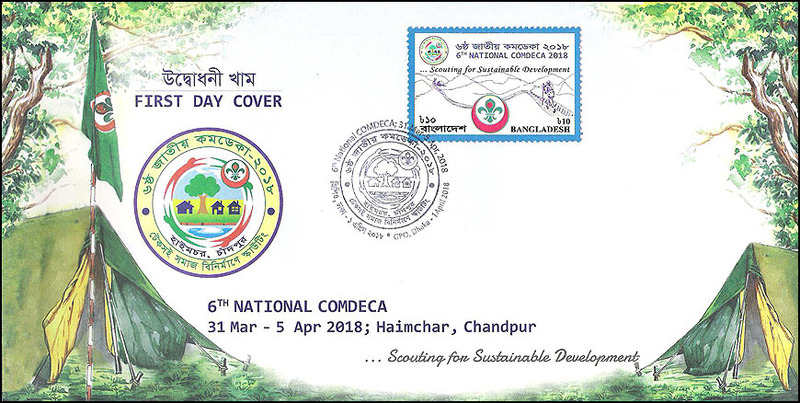 A single stamp issued for the 6th National COMDECA (Community Development Camp) held 31 March - 5 April 2018 at Charbhanga in Chandpur District. 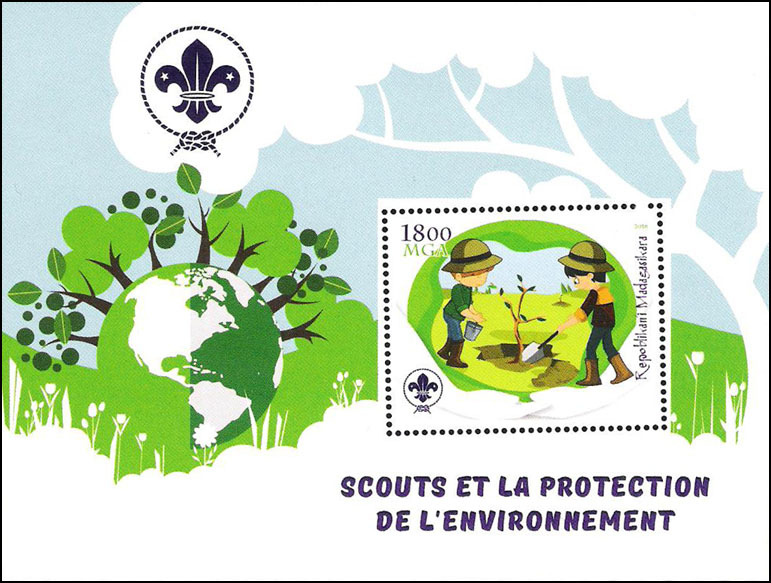 The theme of the camp was "Scouting for Sustainable Development." 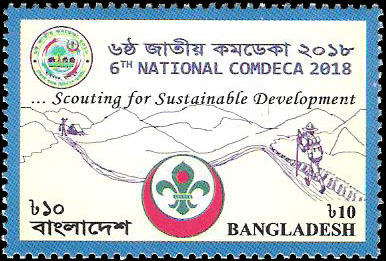 Designer: Tapash Kanti Golder, the Deputy Director (International) of Bangladesh Scouts. 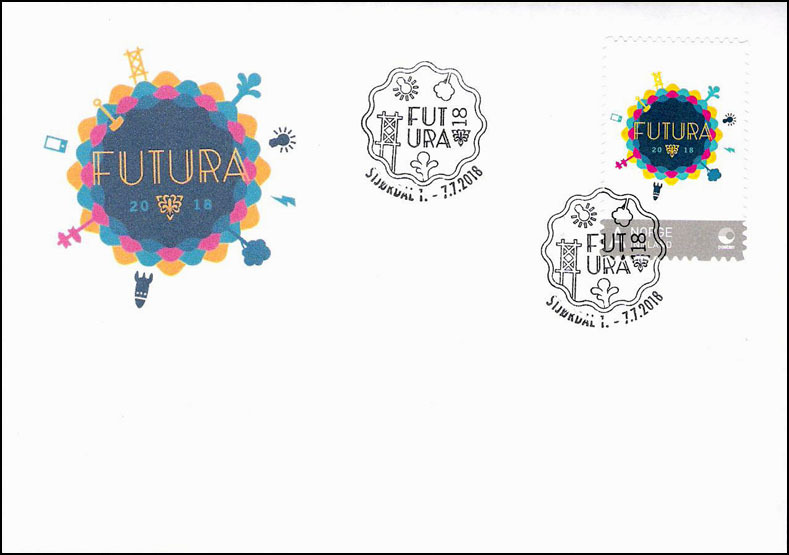 He also designed the first day cover and cancellation. 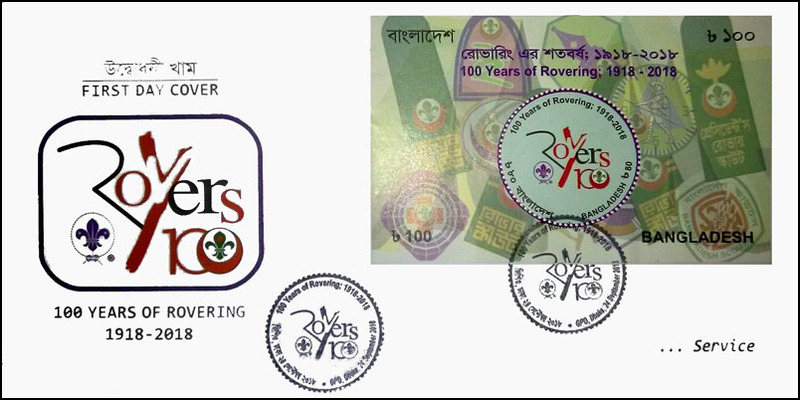 Printing: Offset by The Security Printing Corporation (Bangladesh) Ltd. Gazipur. 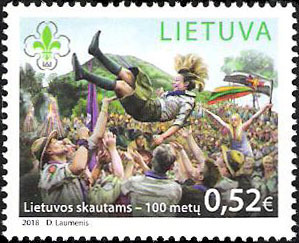 A single stamp depicting Scouts playing was issued to commemorate 100 years of Scouting in Lithuania. 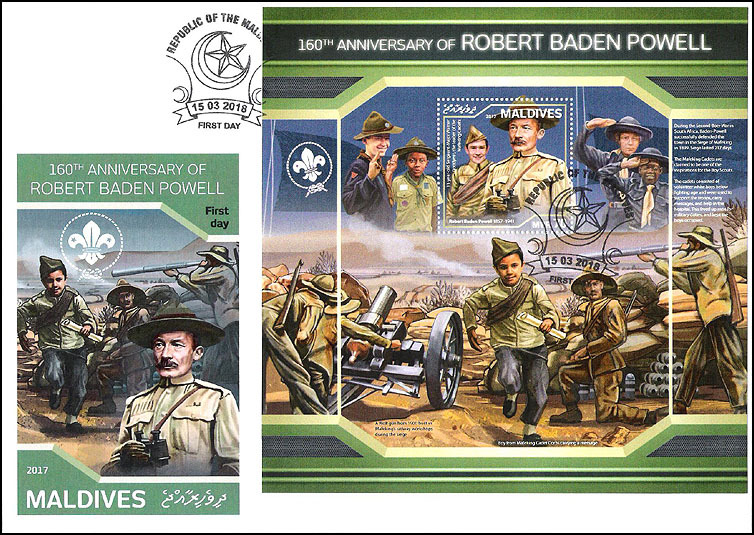 American-born Lithuanian Petras Jurgela formed the first Scout unit in Vilnius in 1918. 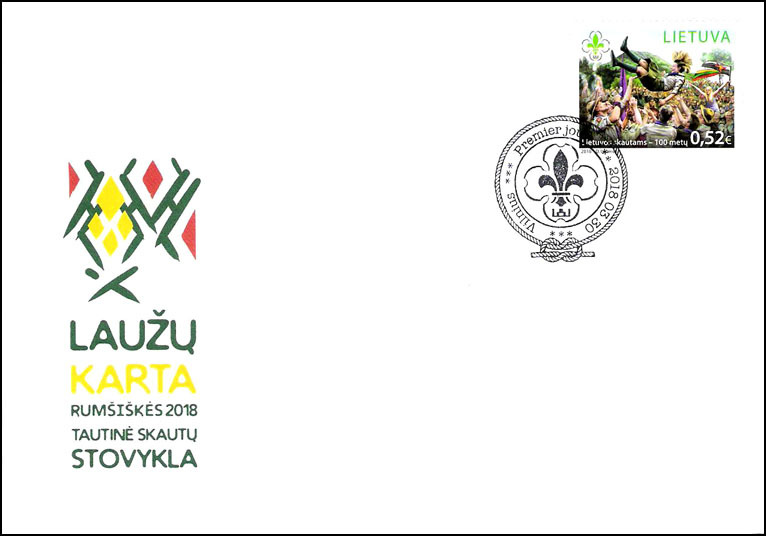 The Ministry of Culture issued three postal cards in conjunction with 100 years of Scouting in the Czech Republic and the 100th anniversary of the 1918 Czech Scout Post. 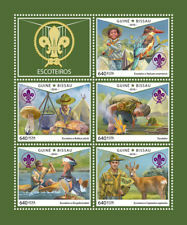 One postal card shows a hand with the Scout sign with background images such as the 1918 Scout Post stamps. 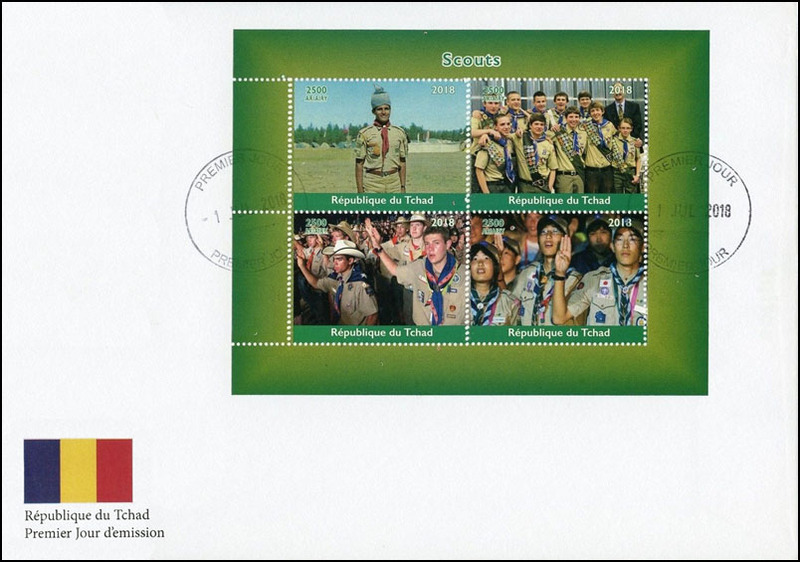 The Postal Museum and Scout Institute are also mentioned. 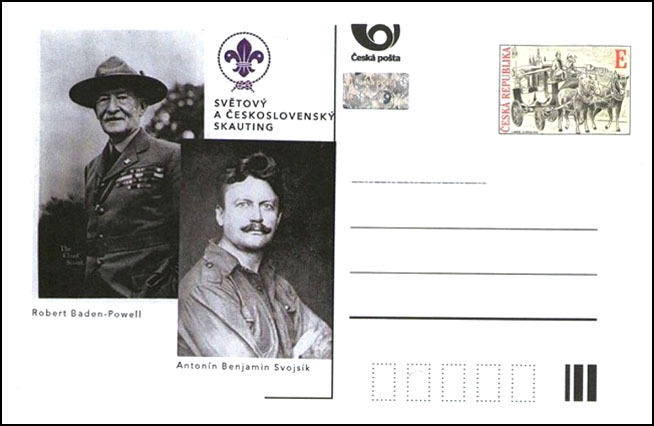 A second postal card pictures Robert Baden-Powell, founder of World Scouting, and Antonin Benjamin Svojsik, founder of Czech Scouting. 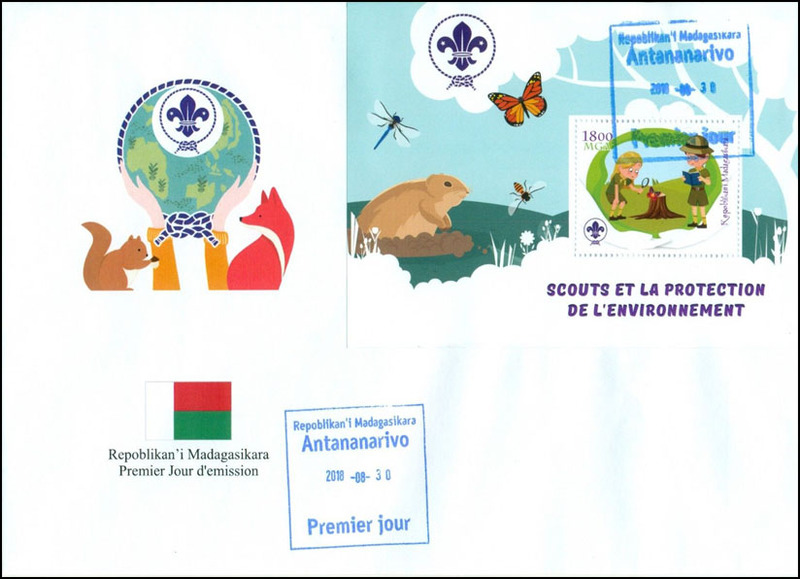 These two postal cards are valid for international mailings. 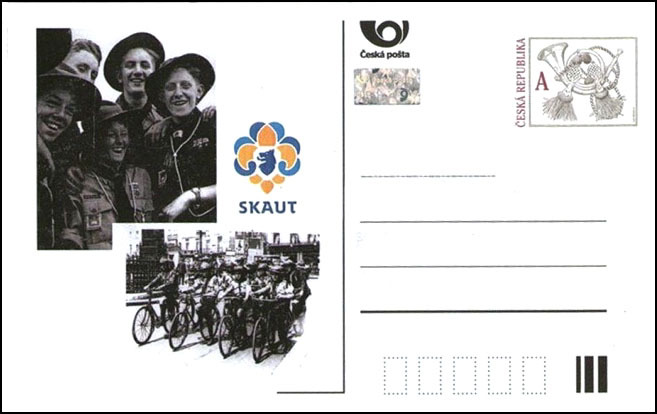 The third postal card, valid for domestic use only, has pictures of a group of early Scouts and probably a bicycle rally. 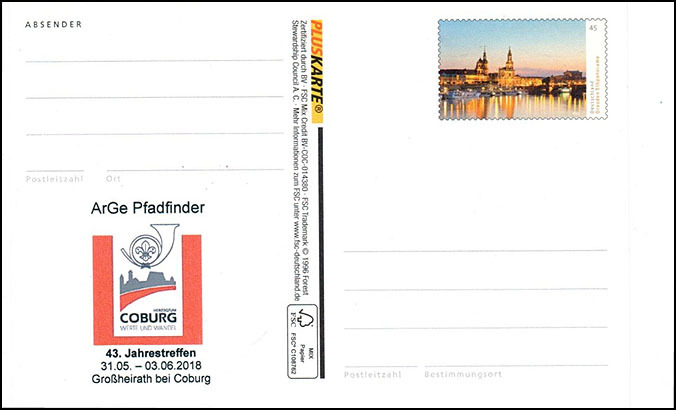 A postal card issued for the 43rd annual meeting of ArGe Pfadfinder (German Scout and Guide collectors club) from 31 May - 3 June 2018 at Grossheirath near Coburg in Bavaria. 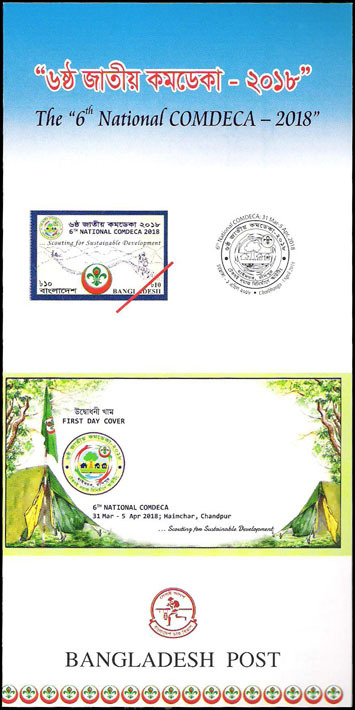 It is valid for domestic use only. 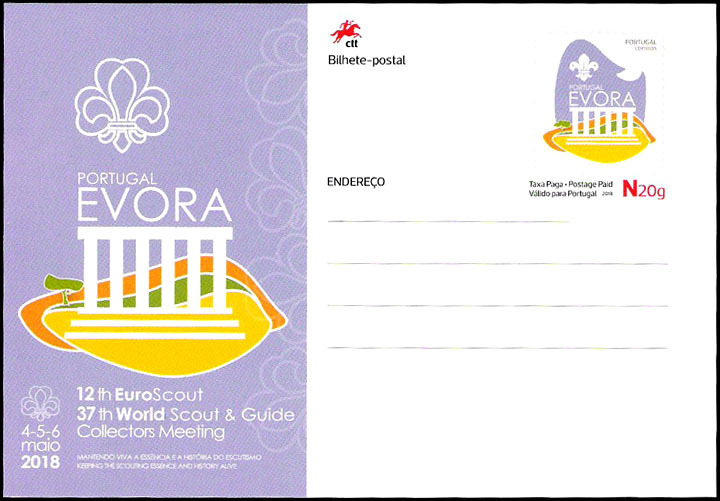 Postal card issued for the 12th EUROSCOUT and 37th World Scout & Guide Collectors Meeting held at Évora, Portugal from 4 - 6 May 2018. 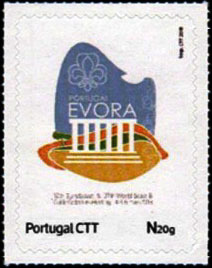 The design of the postal card and cancellation features the Évora Arena, a historical landmark where the meetings were held. 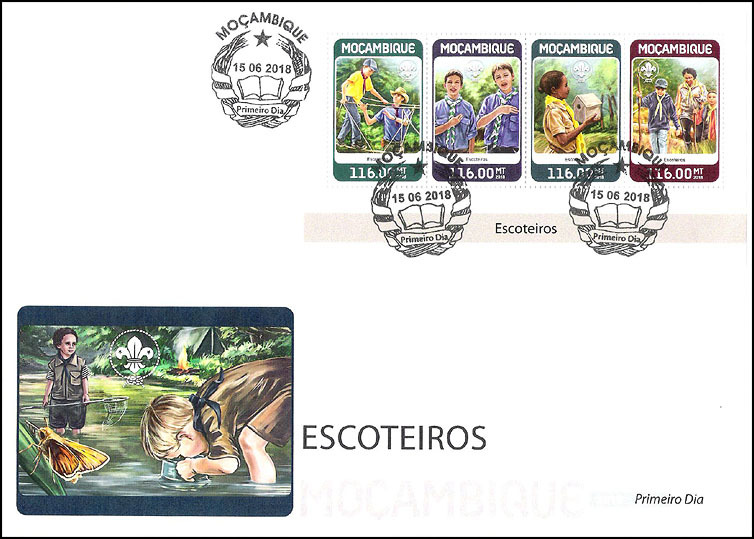 Set of 5 Souvenir sheets (perf & imperf). 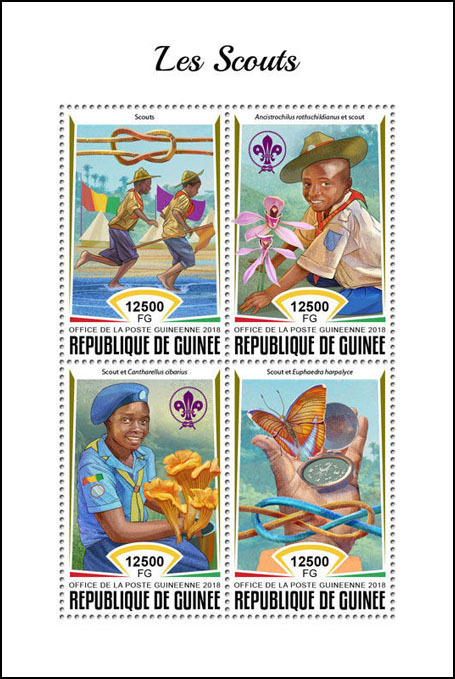 The SSs each have a circular stamp depicting Benin Scouts and Guides in various activities. 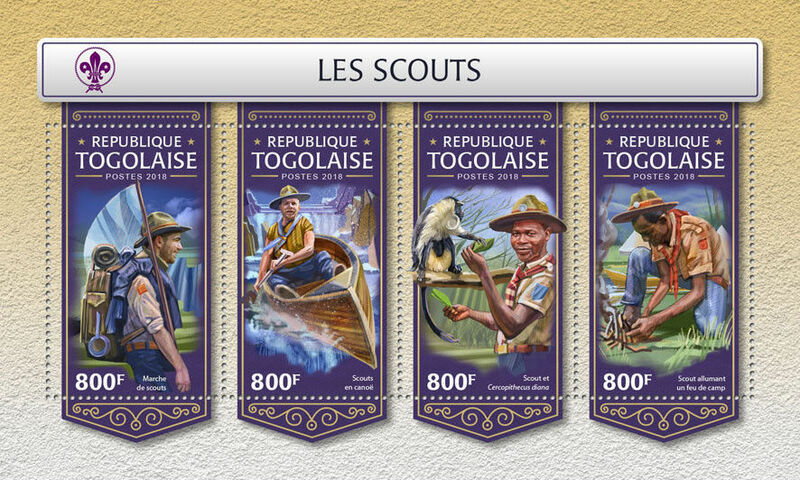 The selvage depicts African nature scenes. 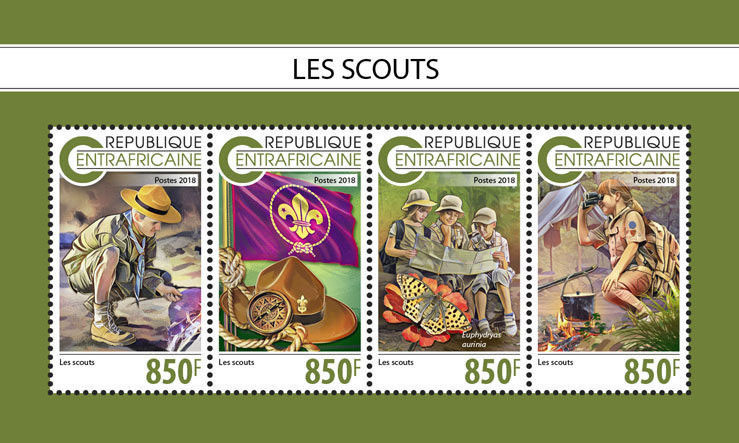 Value of each SS - 1500 F. World Scout emblem on each stamp and in the selvage. 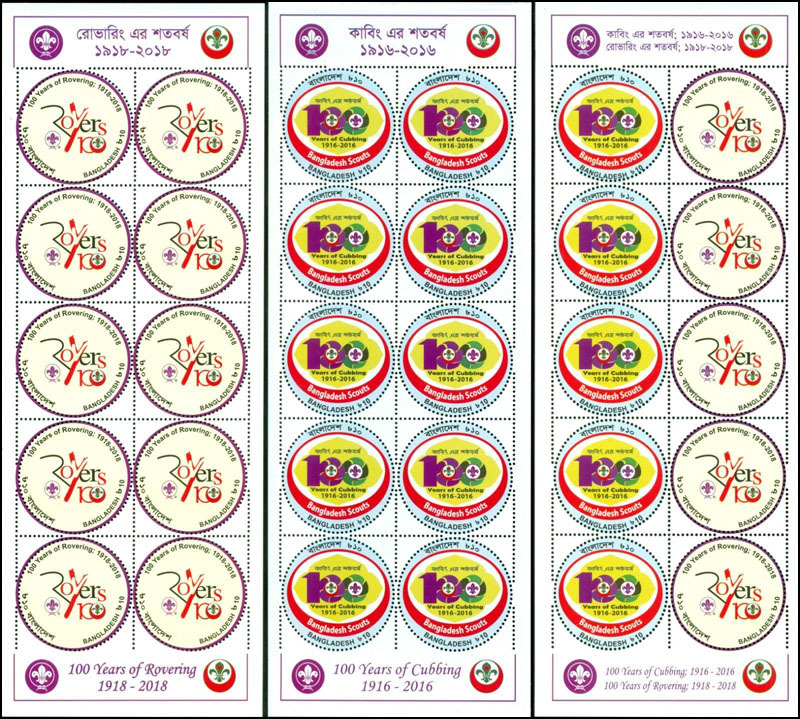 Miniature sheet of 4 and souvenir sheet (perf & imperf). 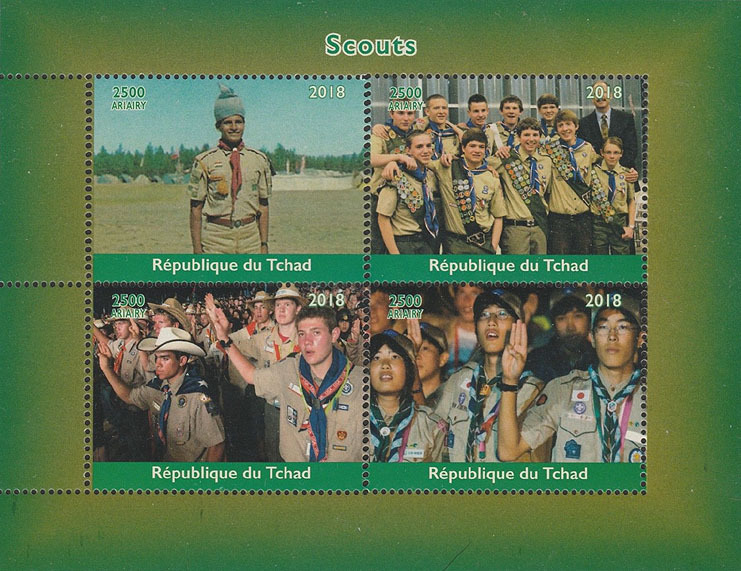 One stamp shows a Chad Scout, one a group of American Scouts, one a group of Japanese Scouts and another group of Scouts from different countries. 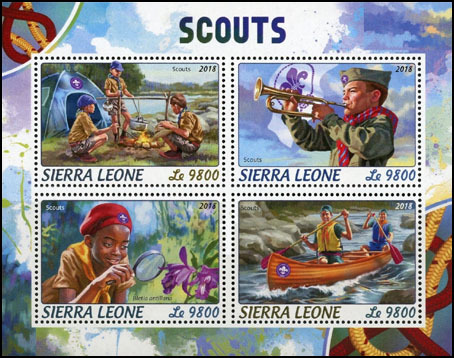 Groups were probably at a World Jamboree. 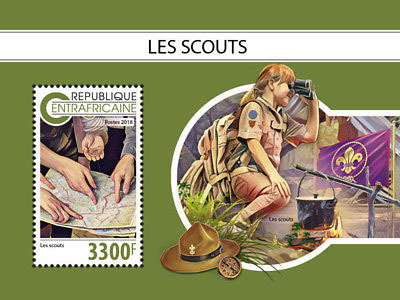 Miniature sheet of 4 and souvenir sheet (perf & imperf). 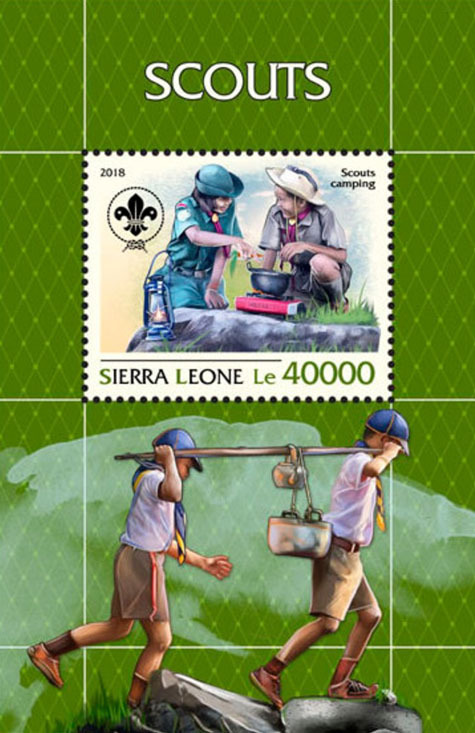 Stamps in MS depict Scouts cooking, Girl Scouts with leader, Scouts saluting and a Scout with leader while SS depicts Scouts map reading and around a camp fire. 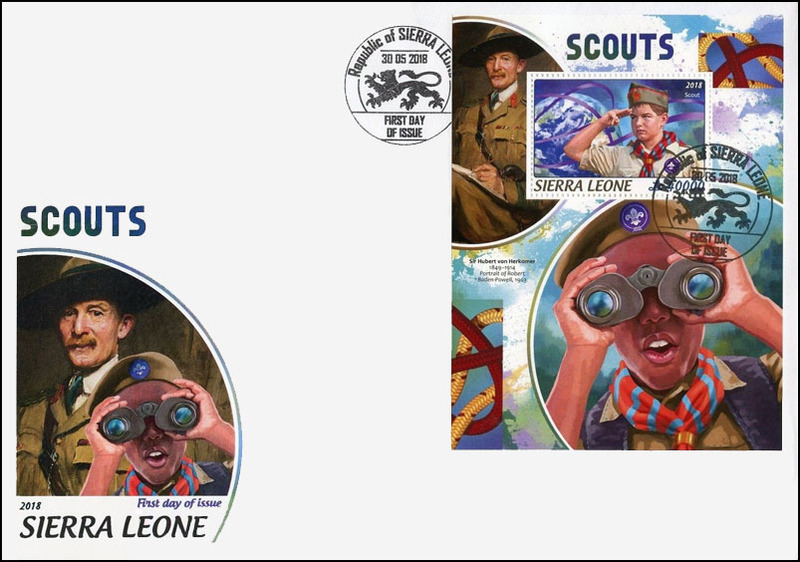 The Scouts appear to be US Boy Scouts. 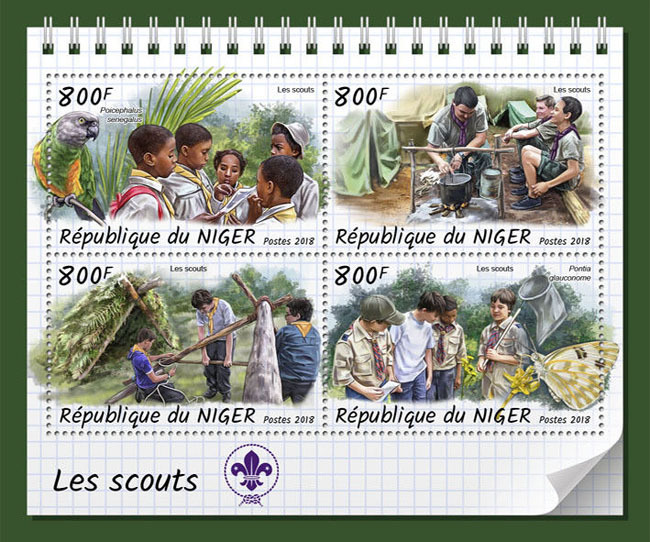 Souvenir sheet (perf & imperf). 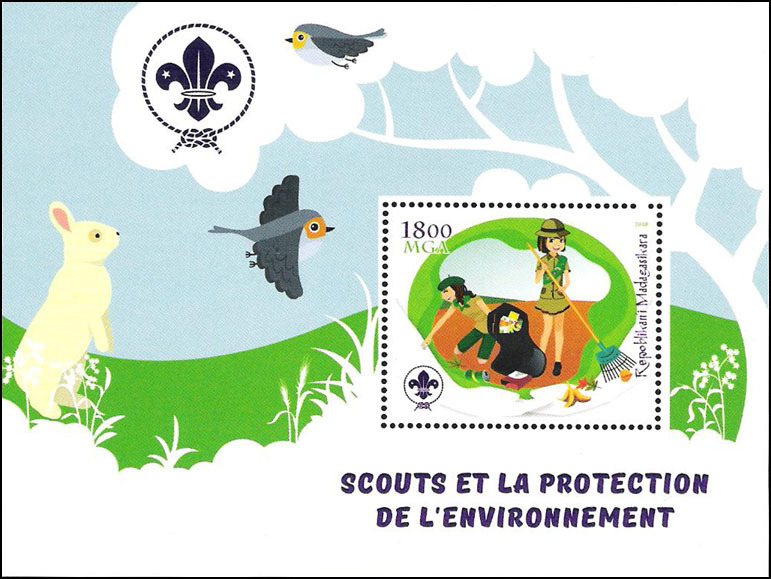 The 50000 GF stamp shows Brockite from Pakistan. 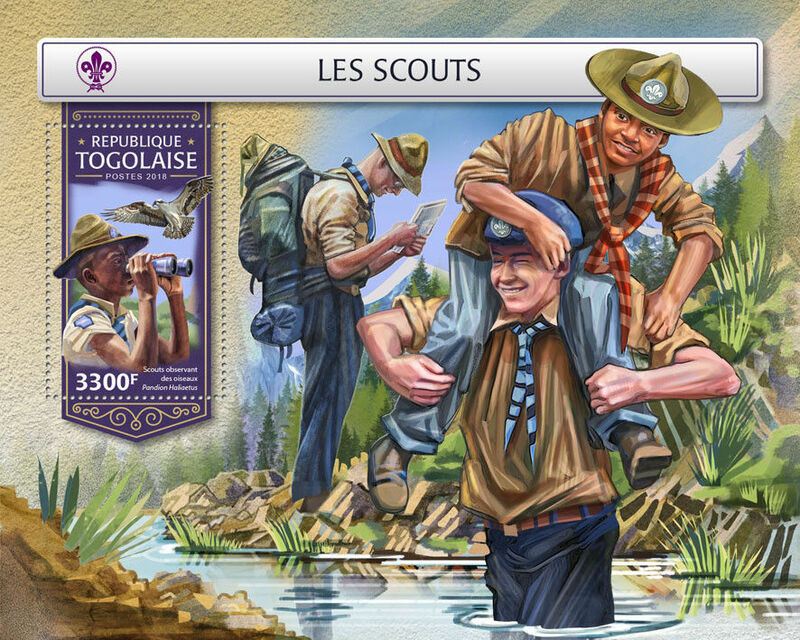 The selvage shows two Scouts with various minerals. 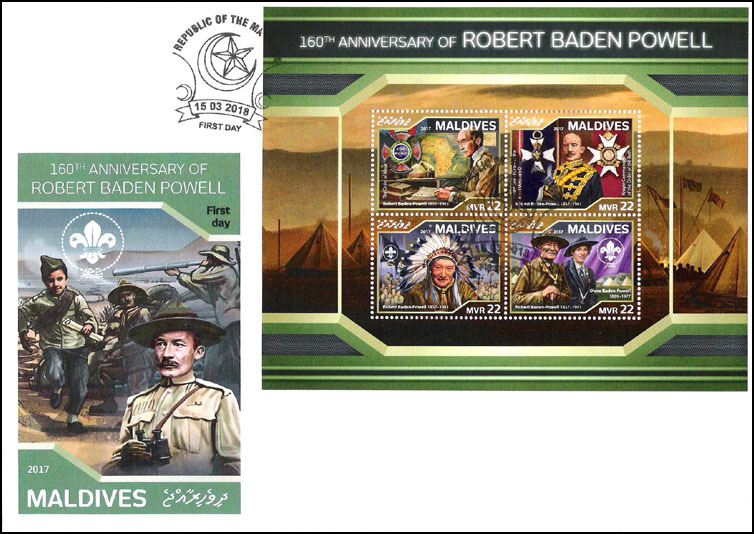 A Miniature sheet of 4 and a souvenir sheet were issued in 2018, although the 160th anniversary of Baden-Powell's birth was in 2017. 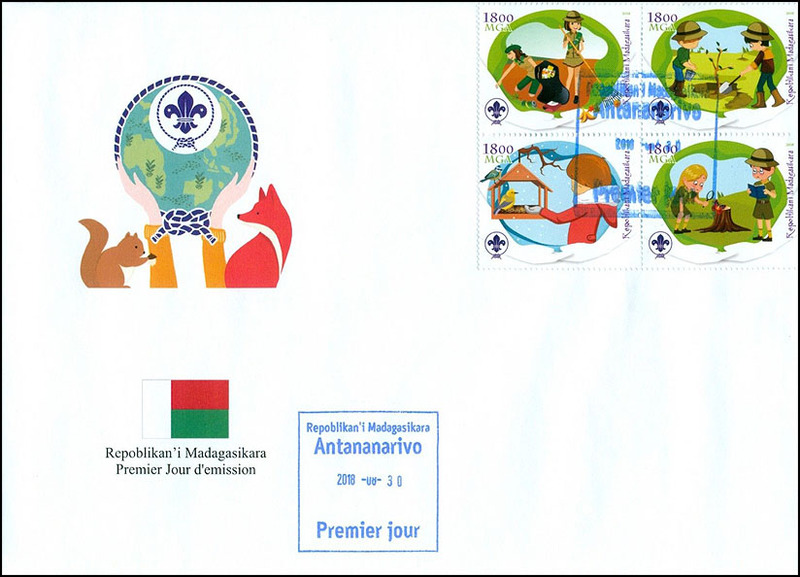 Two of the stamps in the MS show awards B-P received during his lifetime. 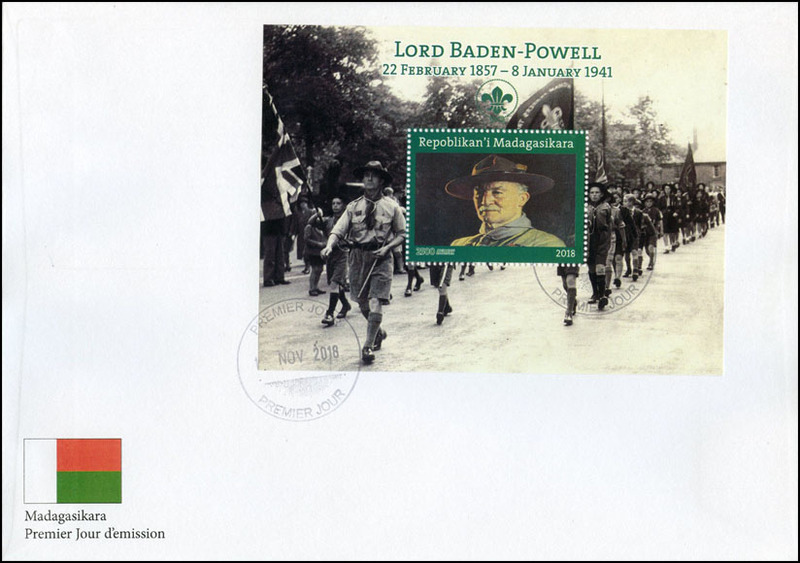 One award was the Order of Merit that he received in 1937. 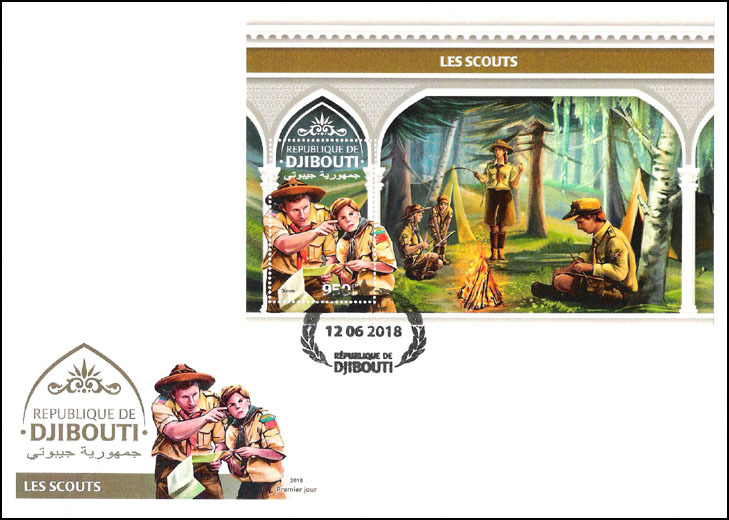 This award, normally limited to 24 living persons, was for distinguished service in areas such as the armed forces, science, arts, literature or promotion of culture. Another award was the Knights Commander of the Order of the Bath. 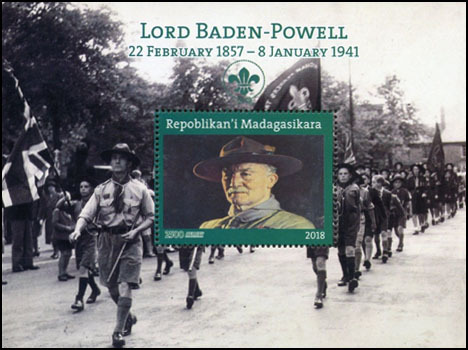 B-P was made a Companion of the Order of the Bath by King Edward VII in 1901 and Knights Commander of the Order of the Bath in 1909. 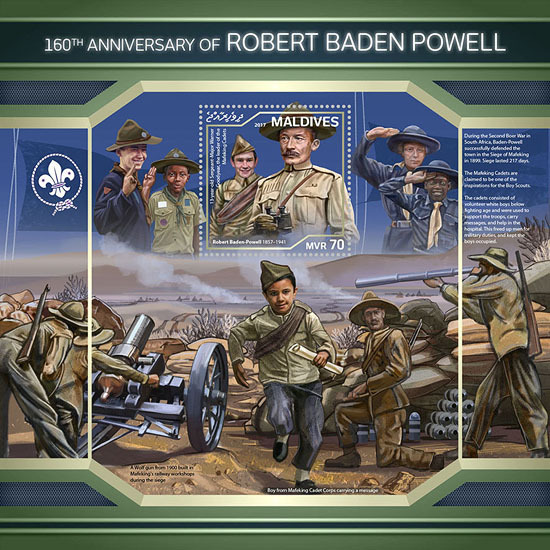 On 1 January 1923 he was awarded the Knight Grand Cross of the Royal Victorian Order. 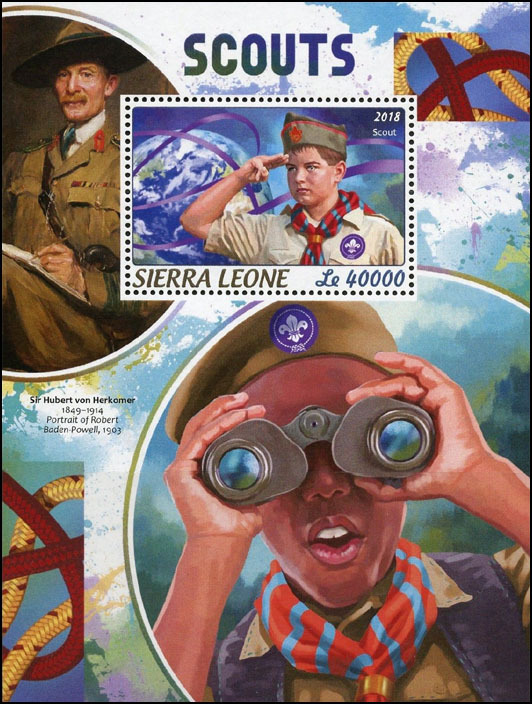 The SS shows B-P with Sergeant Major Warner Goodyear, the 13-year old leader of the Mafeking Cadets, a group of boys not old enough for actual fighting but who were organized as messengers, helpers at hospitals, etc. 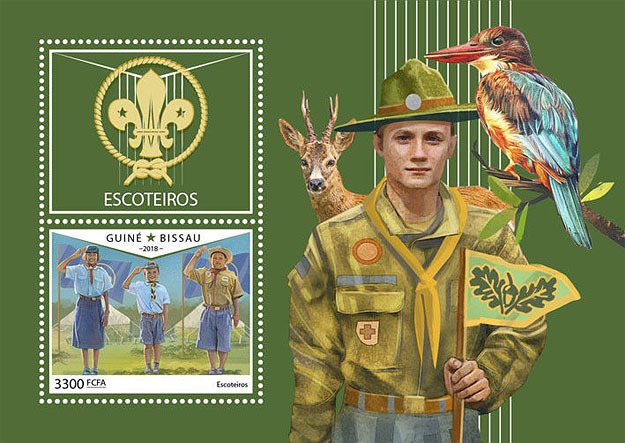 The selvage in the SS depicts a cadet delivering messages and the Wolf Gun, built during the Siege of Mafeking in the Mafeking railway shops. 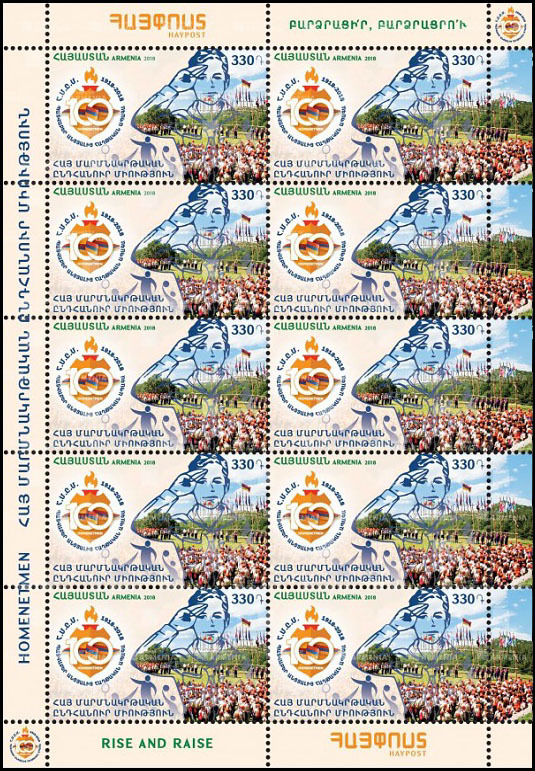 Value of stamps in MS: MVR 22 each; SS value: MVR 70. 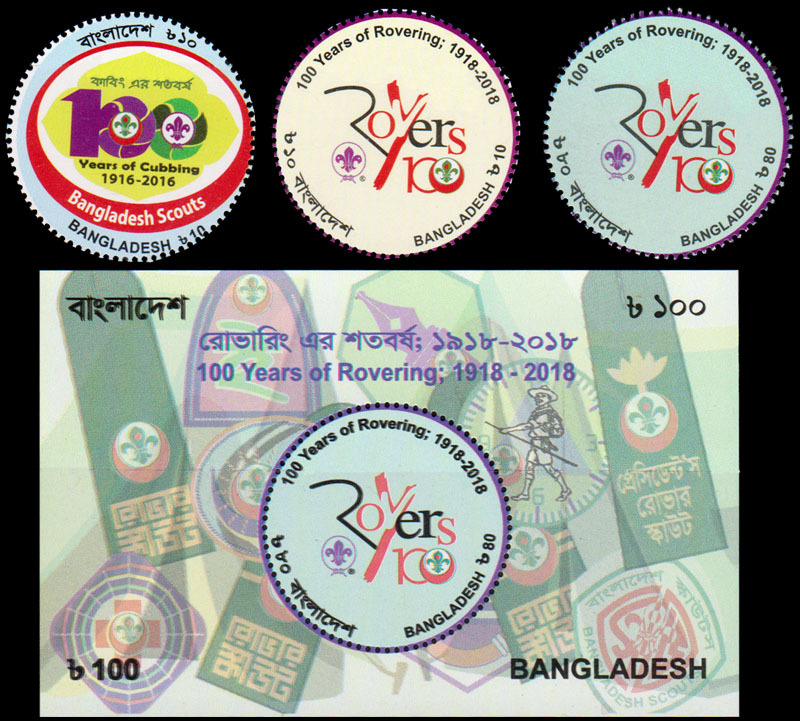 Miniature sheet of 4 and souvenir sheet (perf & imperf). 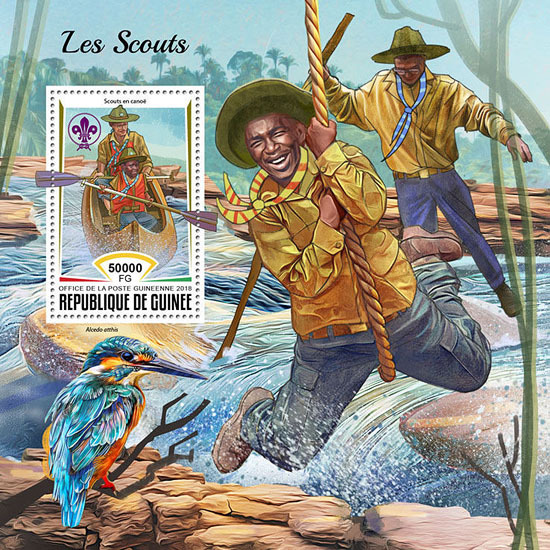 Stamps in MS depict Scouts using monkey bridge, with Scout sign over heart, setting up a bird house, and hiking. 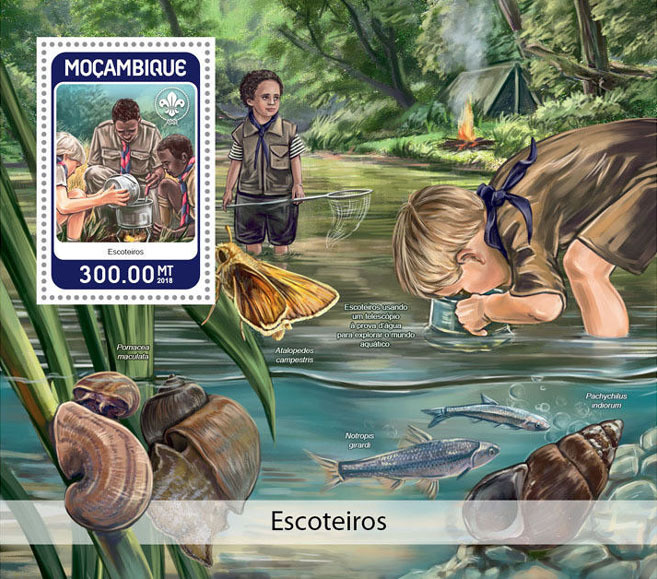 The SS shows Scouts cooking and studying life existing in water. 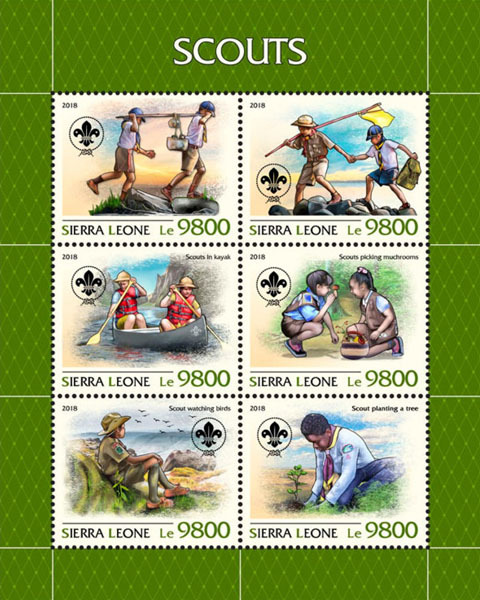 Miniature sheet of 6 and souvenir sheet (Perf & imperf). 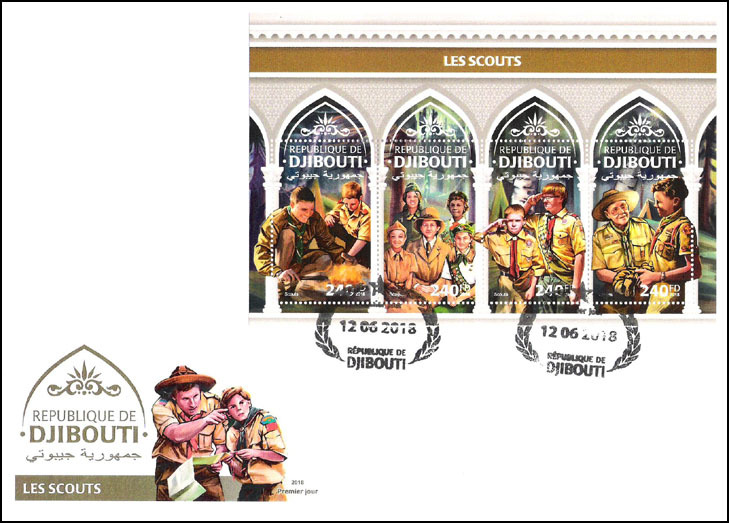 Miniature sheet of 4 and souvenir sheet issued honoring the Scouts. 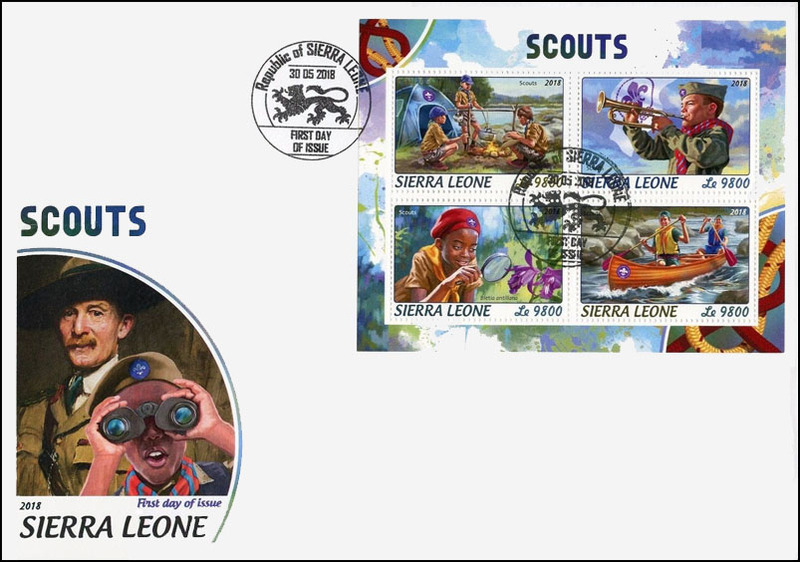 The MS depicts various Scout activities such as backpacking, canoeing, feeding monkey and fire building while the SS shows a Scout with binoculars, a Scout carrying another Scout across a stream and a leader reading a map. 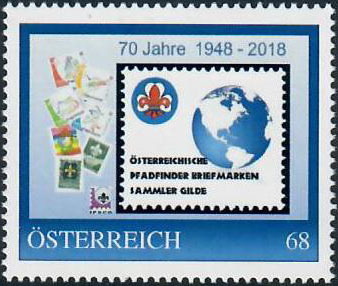 "P" stamp issued on March 10, 2018 for the 70th anniversary of Österreichische Pfadfinder Briefmarken Sammler Gilde (ÖPBSG), or Austrian Scout Stamp Collectors Guild, held at the Scouting Museum of the Institute of Scouting History in Vienna. 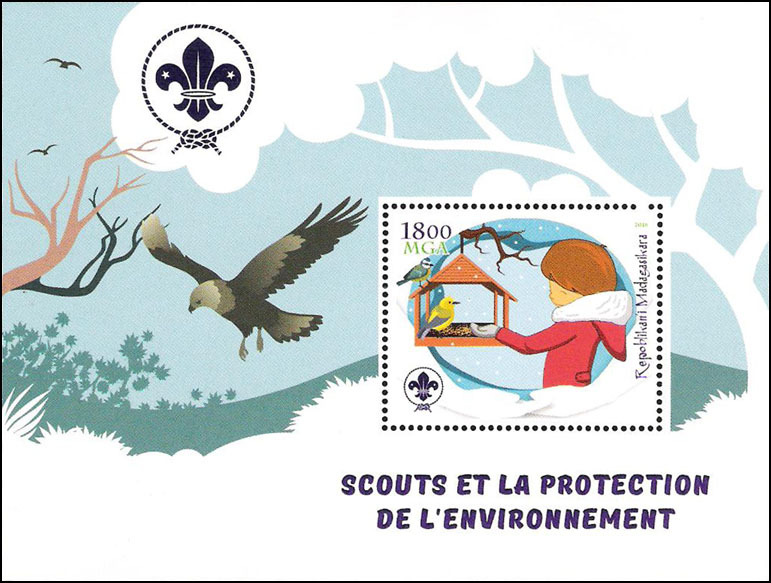 Designed by Erika Schandl with 400 issued. 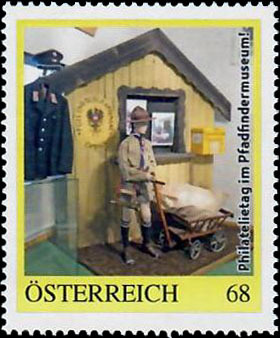 "P" stamp issued on March 10, 2018 by the Vienna Post Office depicting an effigy of the Scouting Museum during the 70th anniversary of the ÖPSBG. 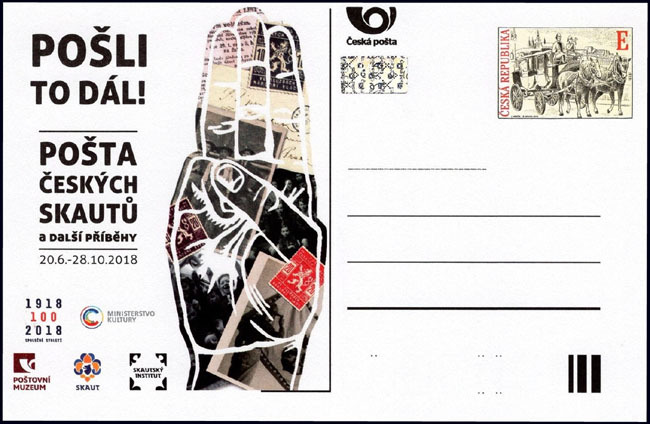 A person had to buy 20.00 Euros of stamps from the Post office to get a "P" stamp. 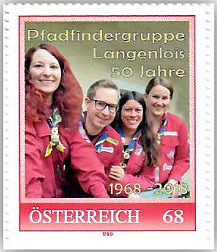 "P" stamp issued in May 26, 2018 for the 50th year of the reestablishment by Erwin Iro and Albert Fries of the Pfadfindergruppe Langenlois in the town of about 7,000 people in the Krems-Land district of the State of Lower Austria. 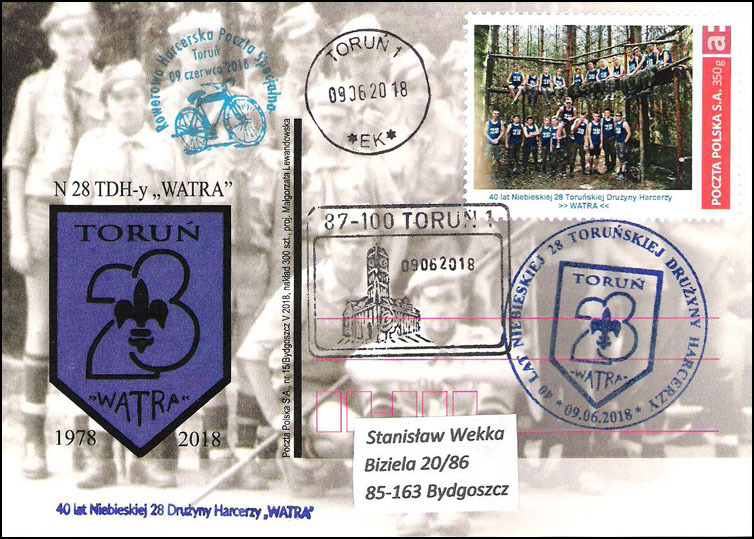 There are about 100 members in the group. 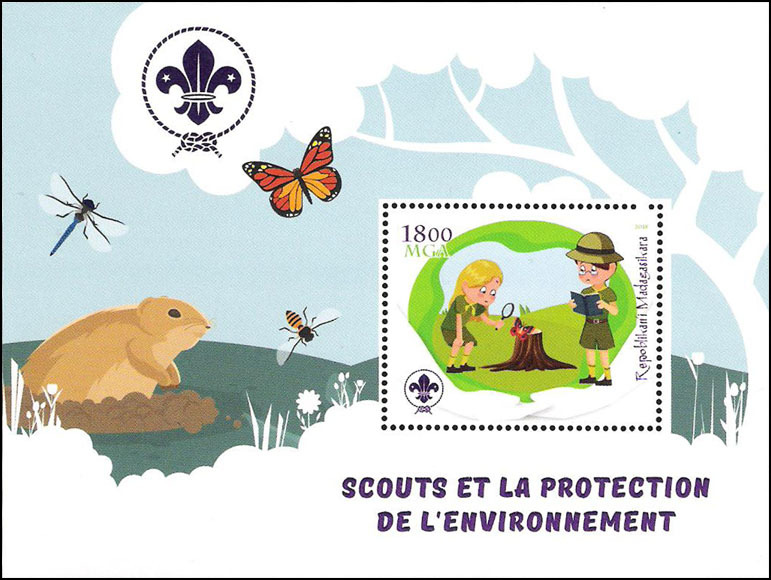 Designed by Albert Schweitzer. 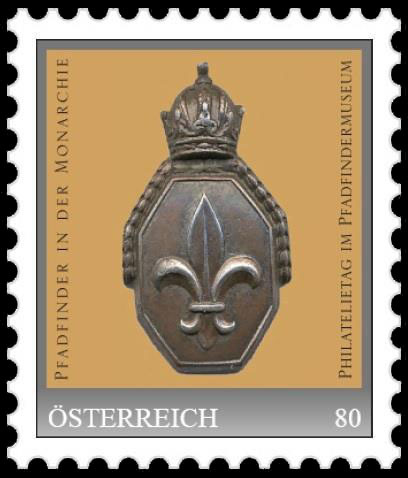 At philatelic day 13 September 2018) at the Pfadfinder Museum, a "P" stamp commemorating Scouting in the Austrian Monarchy was issued. 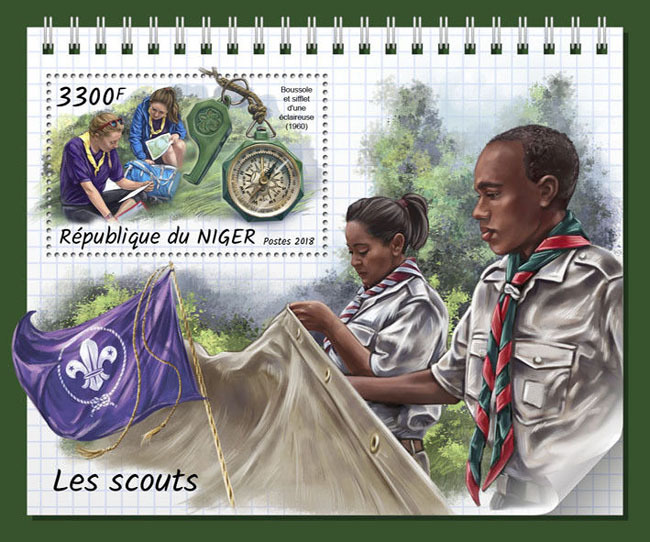 The design shows the Scout badge on a shield below the crown of the Monarchy. 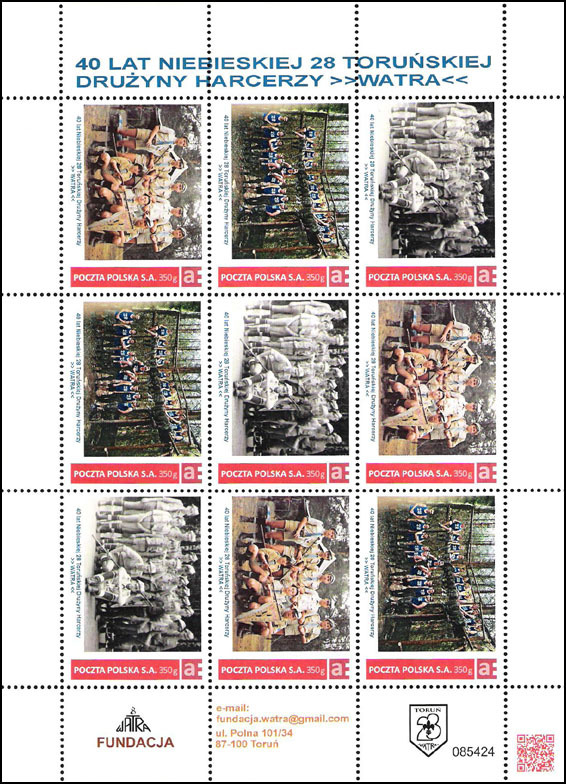 A souvenir sheet of 10 "P" stamps was issued for Intercamp 2018, an international camp held each year over Whitsun weekend since 1967. 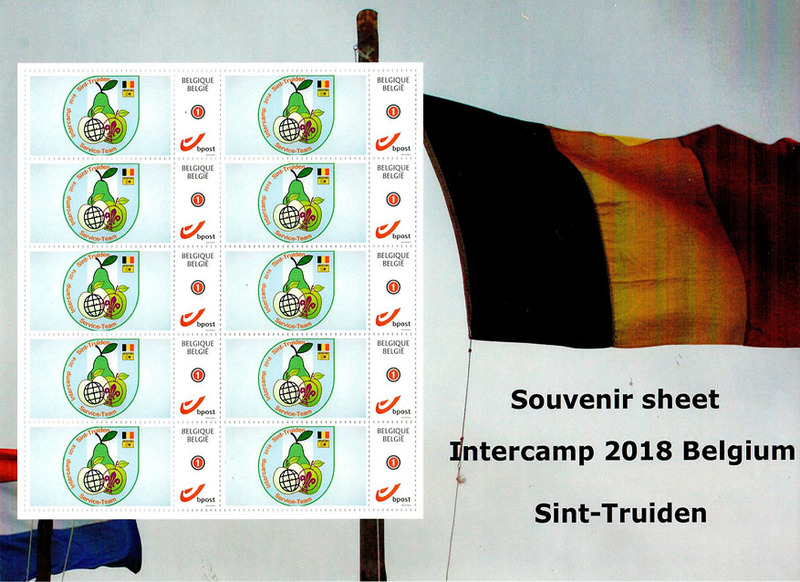 The 2018 Intercamp was held from 18 - 21 May Sint - Truiden, Belgium. 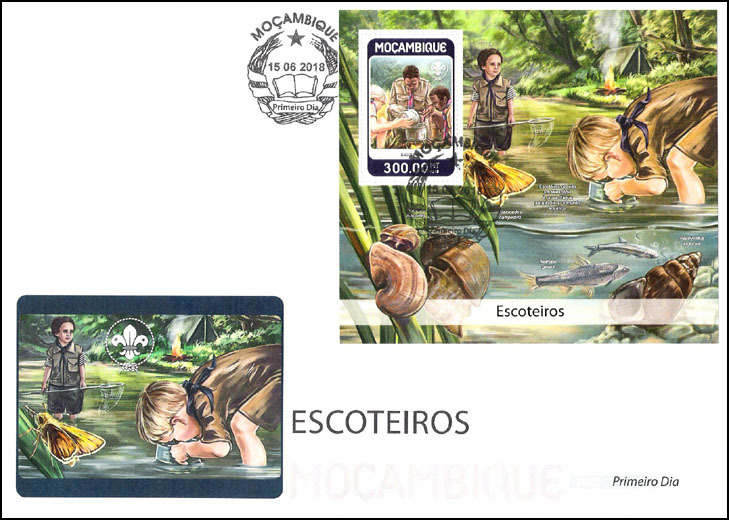 The Service Team is named on the stamp with the design being the Intercamp logo. 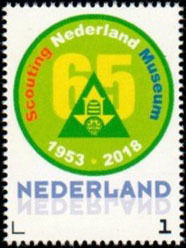 The Netherlands Scouting Museum celebrated its 65th anniversary (1953 - 1918) with a personalized stamp. 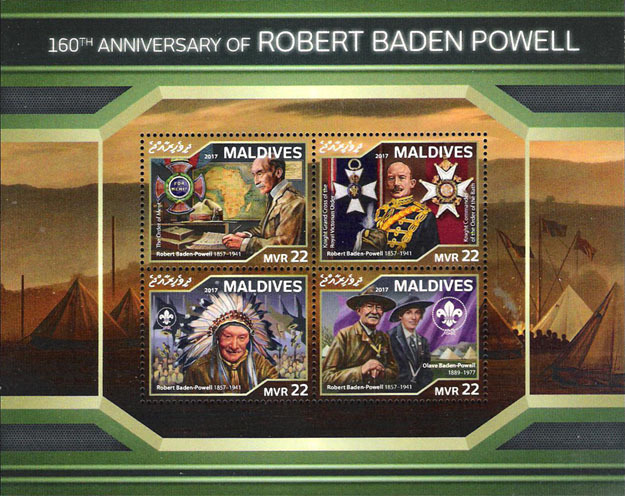 The museum originally opened in 1953 in The Hague in the headquarters of the NPV (Dutch pathfinder Association). It opened its doors in Baarn in 1993 so also the museum is celebrating 25 years in Baarn. 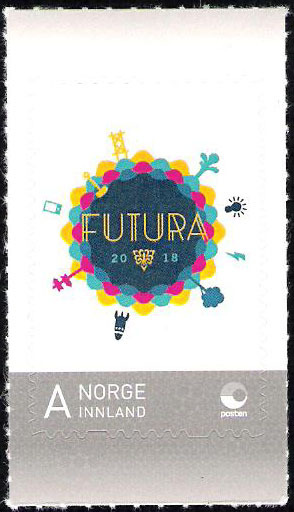 Two personalized "P" stamps were issued in Norway for the national jamboree called FUTURA2018 held by the YWCA/YMCA Scouts of Norway at Sjordal from 30 June - 7 July 2018 with 4,300 participants. 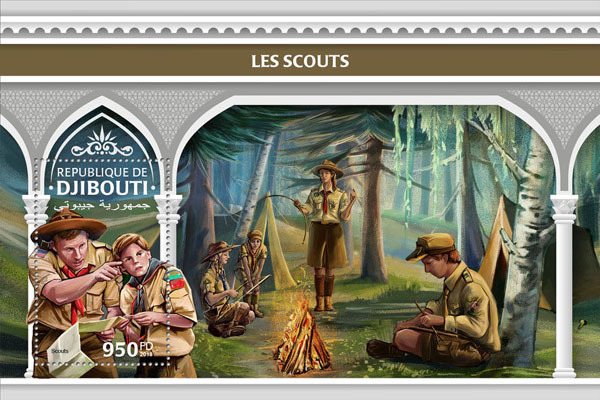 The Scout Stamp Bank operated the camp post office which had its own postmark. 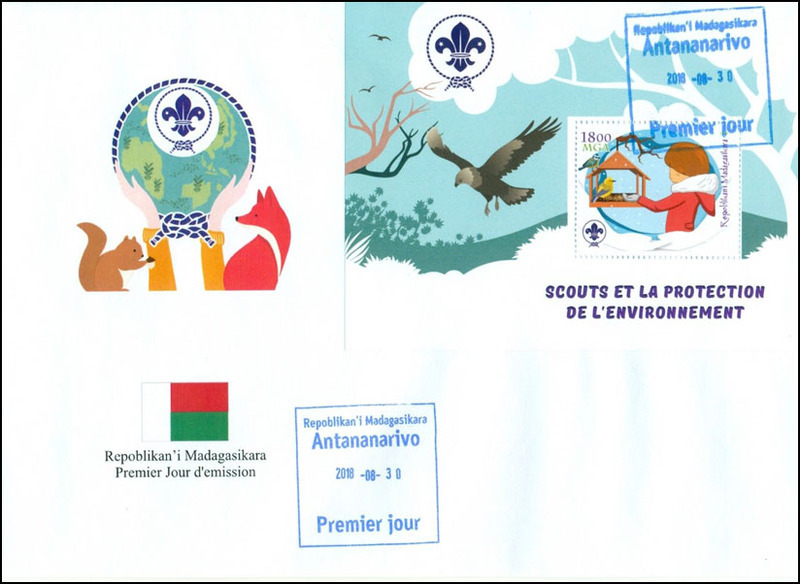 They issued 200 copies of a personalized stamp and 100 copies of a special envelope. 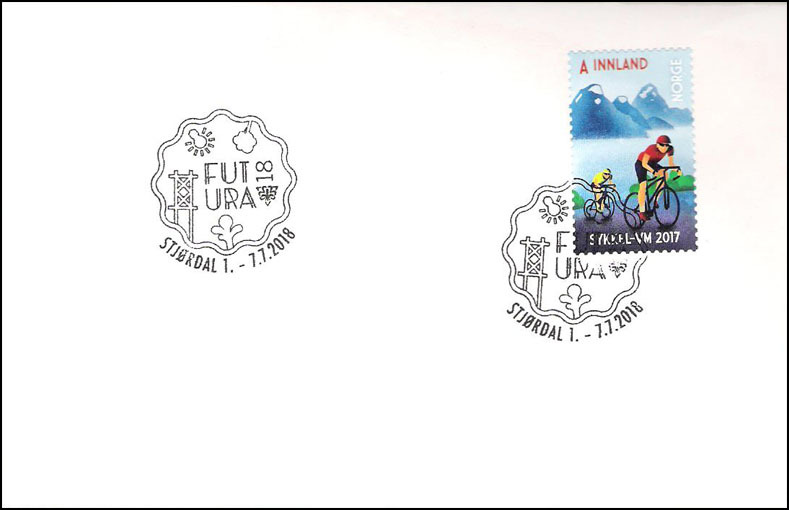 Also, a personalized stamp showing two cyclists was also available. 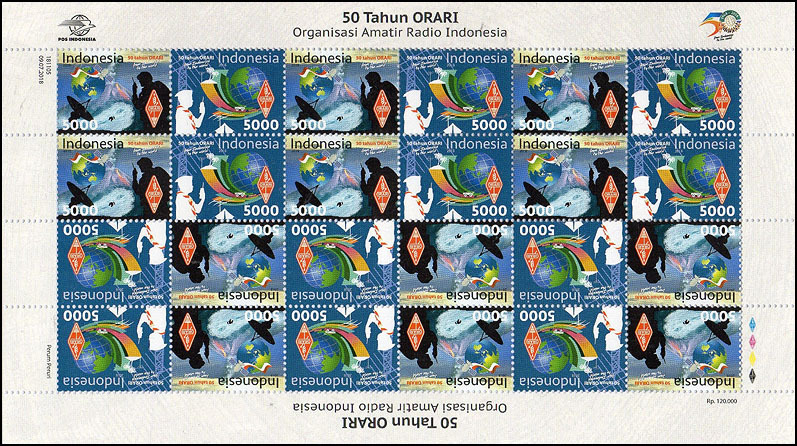 Both stamps were valid for Inland (domestic) use only. 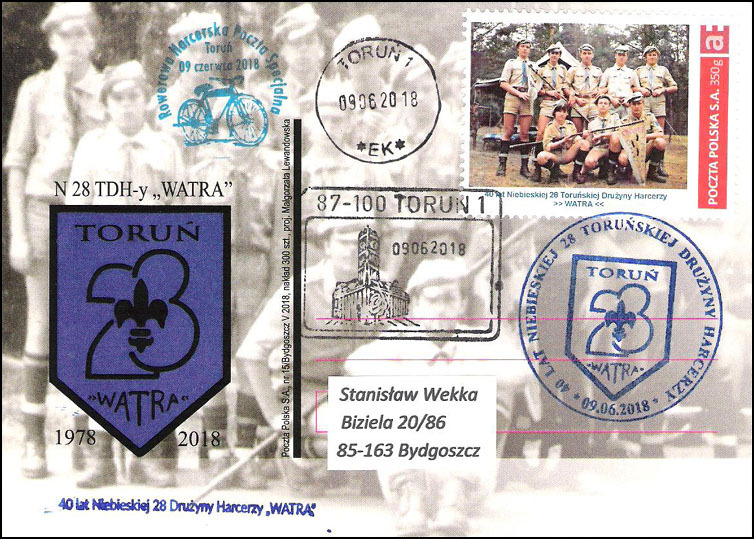 On 9 June 2018, the Foundation of Slavic Culture issued a sheet of 9 personalized stamps (3 each of different designs) that was dedicated to 40 years of activity of the Blue 28th Scout Team "WATRA" of the City of Torun. 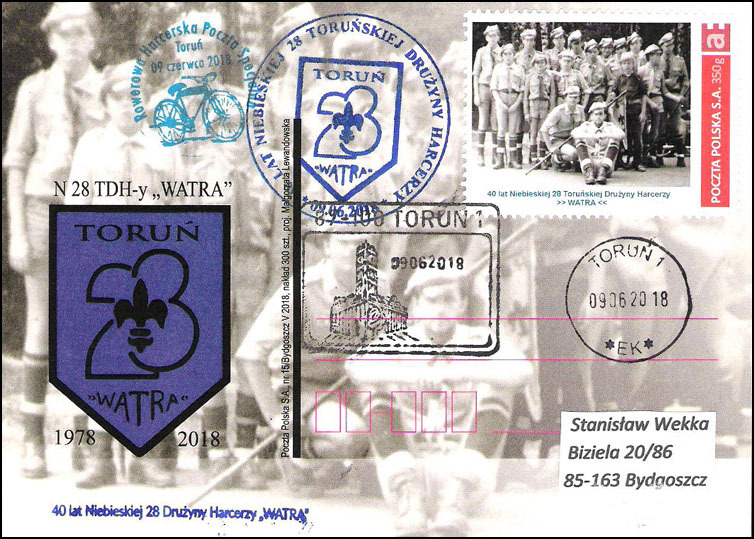 Each of the three different stamps is shown on a "WATRA" post card. 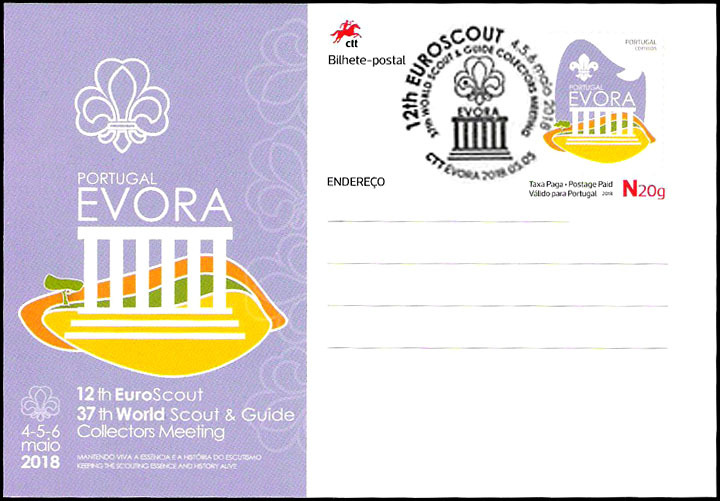 The 37th World Scout and Guide Collectors Meeting and 12th EuroScout were held in Évora, Portugal from 4 - 6 May 2018. 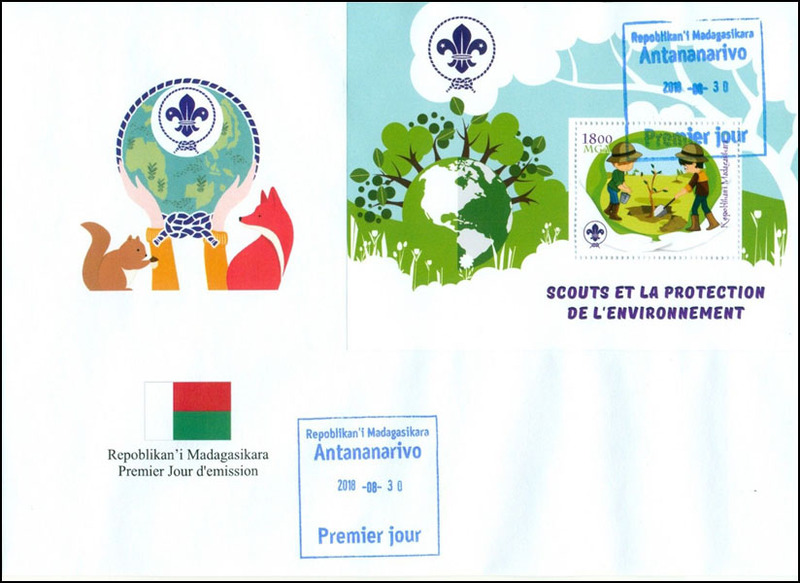 A "P" stamp showing the logo of the meetings was issued for the event. 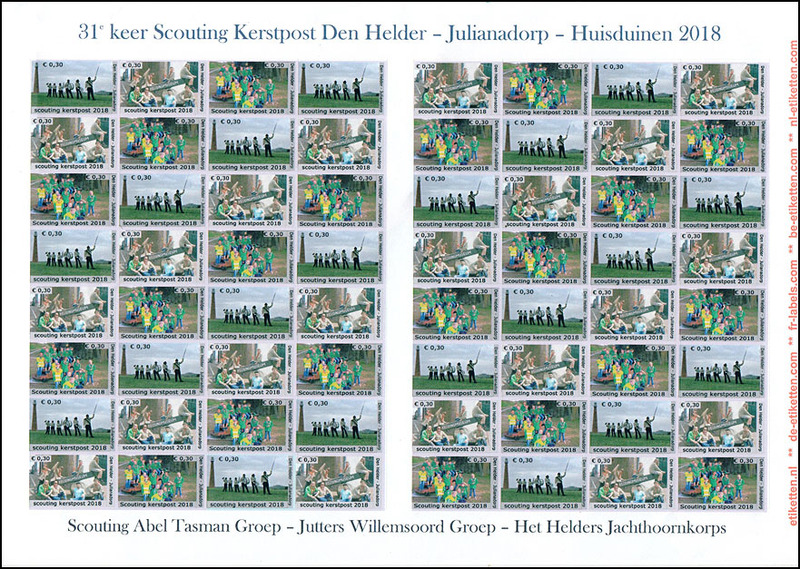 For the 31st time, the Scouting groups Abel Tasman and Jutters Willemsoord and Helders Jachthoorn corps operated the Christmas post (Scouting Kerstpost). 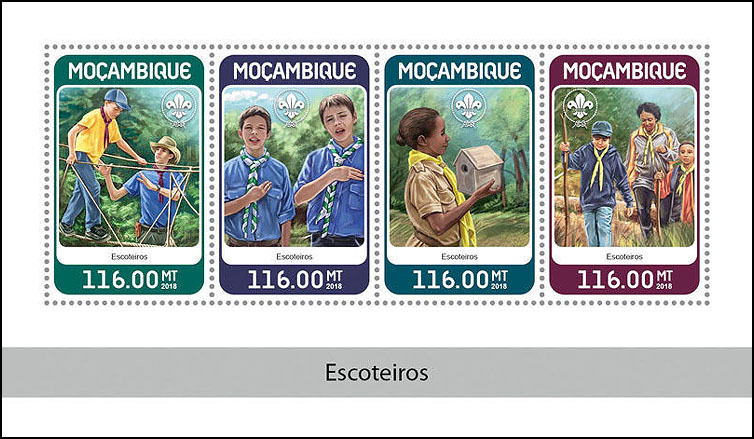 For 2018, they issued three different stamps in a sheet of 64 self-adhesive stamps. 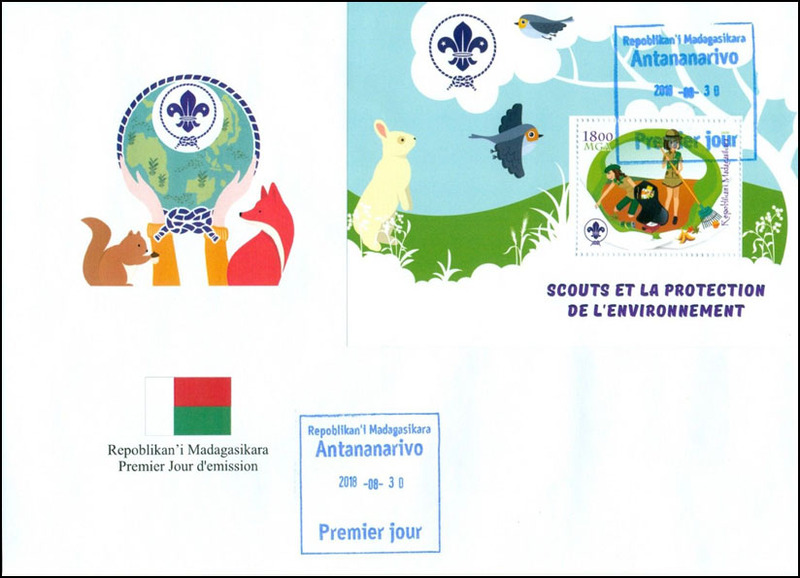 Usage of these stamps is valid only in Den Helder - Julianadorp - Huisduinen and only when the mail is sent to the designated addressee. 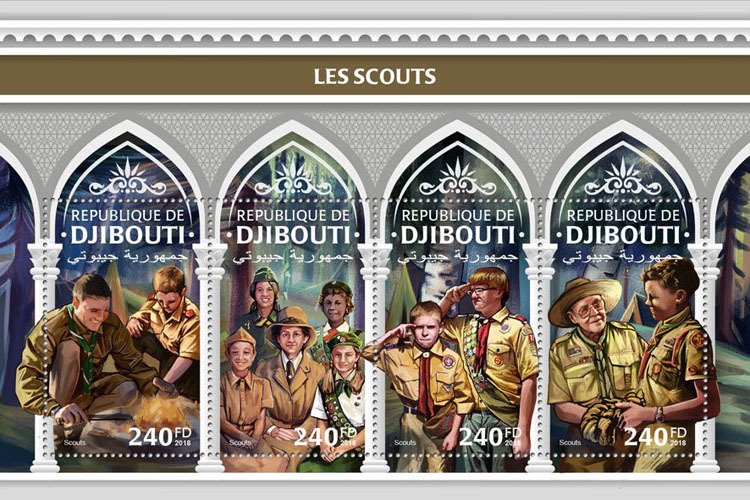 The stamps depict different Scouting groups including a small band.